When asked whether greater use of the internet has a good or bad influence on various aspects of society, general populations in 32 emerging and developing nations say this trend has a good influence on education, as well as on personal relationships and economics. People are more doubtful of the internet’s impact on politics, and morality in particular. However, those who have access to the internet and the highly educated are more likely to say the internet’s growing use is a good influence in these nations. Overall, a median of 64% across the 32 nations surveyed say that increasing internet use has a good influence on education, with only 18% saying it has a bad influence. In 24 nations, a majority say the internet has a good influence on education in their country. While the internet is seen as a positive influence on education in all regions, it is especially true among countries in sub-Saharan Africa and Latin America. A median of 53% across all the countries see the internet as a good influence on personal relationships, with a quarter saying the influence is bad. While people are not as enthusiastic about the internet’s effect on interpersonal relations as on education, it is still generally seen as a benefit in most countries. A similar percentage (52%) say increasing internet usage is good for the economy. This is particularly true for countries in sub-Saharan Africa and Asia. The increasingly connected world is not, however, seen as much of a positive influence on politics. A median of only 36% among those surveyed say the internet has a good influence on politics, with a nearly equal 30% saying it has a bad influence. 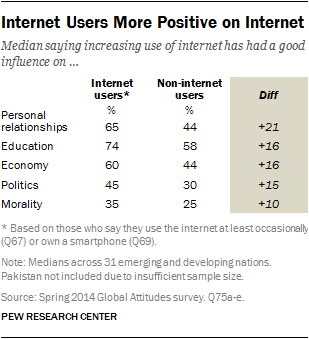 Positive views of the internet’s influence on politics range from 53% in Nicaragua to 20% in Pakistan. Meanwhile, in Lebanon, 53% say that the internet has a bad influence on politics. The aspect of the internet that generates the greatest concern is its effect on a nation’s morals. Overall, a median of 42% say the internet has a negative influence on morality, with 29% saying it has a positive influence. The internet’s influence on morality is seen as the most negative of the five aspects tested in 28 of the 32 countries surveyed. 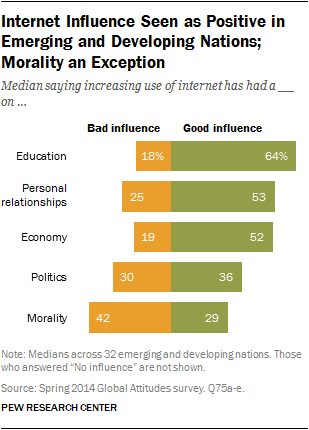 And in no country does a majority say that the influence of the internet on morality is a positive. While most people surveyed believe the internet has a good influence on many aspects of life, there are certain segments of the population that are more positive about the internet’s effect. One major subgroup that sees the internet positively is internet users themselves. For example, while a median of only 44% among non-internet users across the countries surveyed say that the internet is a good thing for personal relationships, that number jumps to 65% among internet users. And while a median of 58% among non-internet users in these countries say that the internet has a positive for education, it is 74% among internet users. Similar gaps appear for the internet’s influence on the economy and politics. As with internet use and activities, in many countries young people (18-34 years old) are much more likely to say that the internet has a good influence compared with older people (ages 35+). This is especially true on its influence of morality, education and personal relationships. For example, 48% of Vietnamese ages 18 to 34 say that the internet has a good influence on morality, yet only 33% of those 35 and older agree. And in Ukraine, 73% of young people say the internet has a positive influence on education, while only 54% of those over 34 agree. Meanwhile, 71% of Lebanese youth say the internet has a good effect on personal relationships, while only 43% of older Lebanese agree. Additionally, the highly educated are much more likely to see the internet as a positive force in their country. For example, across the 29 countries with sufficient sample sizes to analyze, 70% of those with a secondary education or more say the internet is a good influence on education, while only 59% of people with less than a secondary education say the same. Similar gaps between the more and less educated appear on the perceived influence of the internet on all aspects tested.